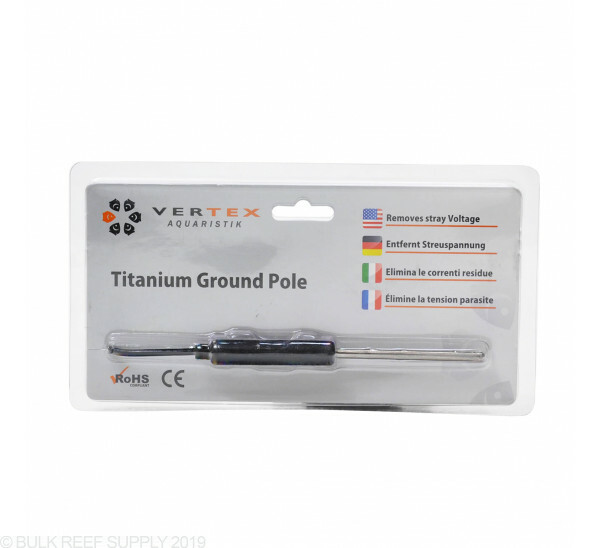 Use the Vertex Titanium Grounding Pole to protect your saltwater aquarium from stray voltage which may come from pumps, heaters, chillers, lighting and any other electrical components in your system. Seems to work very well and its very well made! At times in our hobby we don't know when something breaks until it's too late. With that being said, should you find yourself with a faulty piece of equipment, that is leaking voltage into your tank, a ground probe will keep you from being shocked as well as your livestock! Should you have a faulty piece of equipment it's best coupled with a GFCI that way the power is tripped completely but, only if the load is too much for the GFCI. A little stray voltage is not going to trip your GFCI but, can overtime cause your livestock, especially free swimming livestock to become affected, harming or even killing them! I speak from experience unfortunately! Best bet is to keep a ground probe to maintain no voltage in tank! As Deez said in his review this is a 'required' piece of equipment. 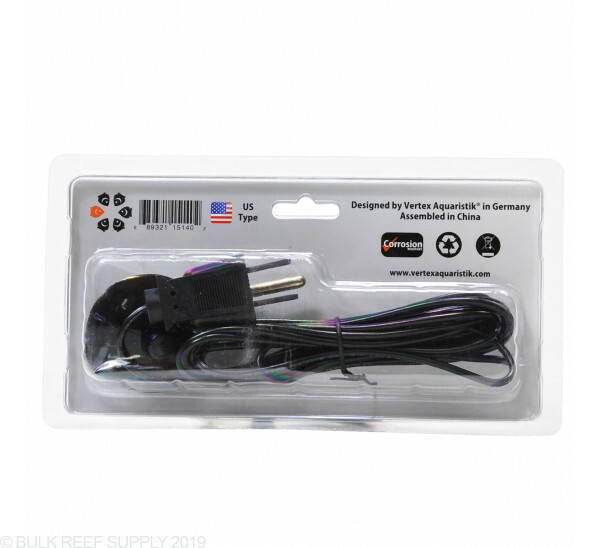 Another 'required' piece of equipment should be a GFCI outlet for your aquarium electrical connection. 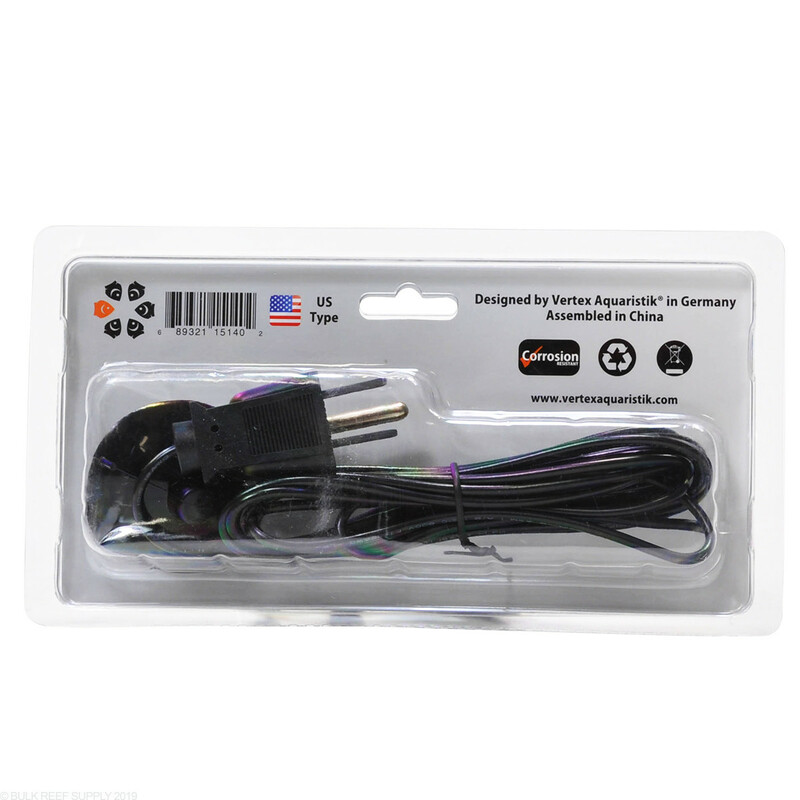 This probe creates a path between the aquarium and the ground wire on your GFCI wall outlet. A GFCI outlet measures the current leaving the hot (load) wire (that's the small vertical slot on the right) and then measures the current returning back on the neutral (thats the larger vertical slot on the left). If there is a loss in current returning to the neural then the GFCI trips and shuts off the outlet. The main reason there would be a loss in current is that current has found an "unintended path to ground". In an aquarium if something like a heater were to malfunction then the salt water becomes energized, and when you put your hand in the water you become the "unintended" pathway for the current to ground (yup, you get shocked). Good news the GFCI would detect the loss in current at the neutral wire a trip the outlet off (but you still get shocked first). But if you install this probe then it gets the super lucky job of being the unintended pathway to ground, it then trips the GFCI and you don't get shocked (yeah!). If you worried about tripping the GFCI accidentally they do sell GFCI outlets that will make a noise (loud beep) if they are tripped, that will get your attention so you can fix the problem and get things working again. Does its job :) Better safe than sorry! This product is great guys. I do need to set the record straight on the reviewer that called this "dangerous". He actually would be right if this created a path to ground meaning from the tank to a ground rod outside... However that is not exactly what this product actually. This is how it works... The rod stays in your water and gets plugged into an electrical outlet this bonds your water to the ground bar at the electrical service and yes ultimately to earth. So if a heater cracks and makes the water "live" amperage goes to infinity and instantly trips the over current protection (circuit breaker) that whatever is causing the problem is fed from. This is absolutely a fantastic redundancy to gfci outlets. And if you don't use gfci this is a must because who is going to take care of your tank if you get taken out by a 40 dollar heater? Not to mention it is only 15 bucks. Trust me guys I've been a licensed electrician in the state of RI for ten years now I know what I am talking about but test it out for yourself. Gfci actually have nothing to do with the "ground" believe it or not. So if you are in an older house that has "open ground" receptacles just a hot and a neutral a gfci will absolutely work protecting the user from faulty equipment being plugged into the outlet however this item would not work if the outlet didn't have a ground I honestly recommend both gfci and this product. It really isn't a debate if the gfi is tripping it is certainly not from this product and if you don't have voltage in the water there are a number of things that cause gfci to trip call an electrician. This product or equivalent should be a must have on all tanks of water as it is for swimming pools cause we all now nobody turns off every piece of equipment before sticking hand in the tank. "Dangerous" is have voltage in your water and the water sitting there live with ought your knowledge and a bunch of fish that are essentially squirrels on power lines. Thanks guys be safe and happy reefing!!! I first ran across grounding probes back when I was keeping sharks and feeling a shock placing my hand in their tank.I wanted to reduce any stray currents messing with their ampullae of lorenzini. They have been a part of every setup I have done ever since. As Michael stated if this thing is tripping your GFCI you have problems you need to address. You do not want to create a path to ground. You want to minimize this when ever possible. Ground probes will constantly trip gfci's leaving your tank with no power and without gfci protection it is just dangerous. I had my toe zap when I worked in my sump! No more current ! Great product! Had loose current and after a year finally gave in and purchased this product. No more shock when I work on my tank. Thanks to the inventor. My pH meter used to constantly fluctuate, never settling on a specific value. I thought it was just the nature of pH meters, but with this ground probe, the bouncing values are gone. I get one specific reading at all times. What can you say about something so simple? It just works. Multimeter was reading 3.4 VAC stray voltage in the tank before adding the product, 0 VAC after. 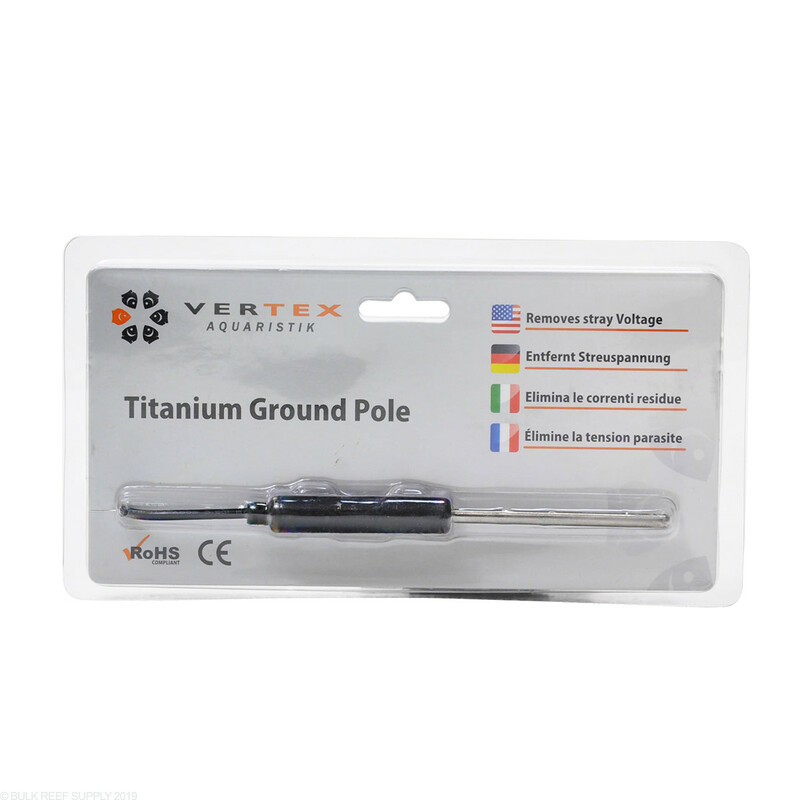 I would definitely recommend this above some other titanium grounding probes that just have a place to screw the lead into something grounded because that will not save your life in the event of equipment malfunction. The only way to ensure that your tank will not shock you is to have a grounding pole that plugs back into the power strip or wall, like this one, and that uses the outlet's ground. If you combine this grounding pole with a GFCI outlet the outlet will trip if any equipment has a ground fault through the tank water. When you notice the power to all your equipment is off you know you have a problem and can fix it before you stick your hands in the tank. Does this need plugged in or what? The probe does need to be plugged into a grounded outlet and will draw off stray voltage through the grounding wire. I have the sump In The basement. Is it enough to one in the sump or should I have 2nd in the DT?